The relationship dynamic that develops between partners beyond the fulfillment of the individuals’ Primary Fantasy is determined by developmental potentials that all adults possess. To better grasp how these multiple dimensions interconnect and affect the quality and sustainability of our partnerships beyond the love-struck phase, we start out by placing the eight stages of consciousness development on a vertical axis in the left side of the graphic below. 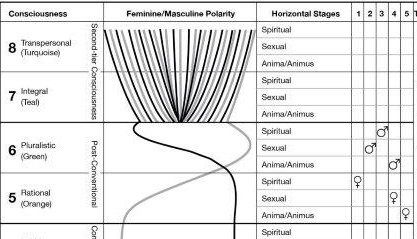 Next to it are two vertical lines, showing the most common tendencies of the feminine and masculine polarities for men and women as they grow in consciousness. 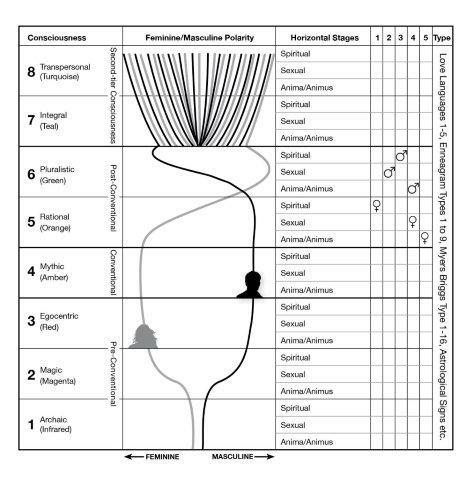 Then we’ll map five state/stages of spiritual, sexual, and anima/animus complex development onto a horizontal axis, since these aspects can develop independently from each other at each level of consciousness. This gives us 1,000 different correlates (8 x 5 x 5 x 5) for the fluid feminine/masculine polarities and personality types of every person (deep breath now). 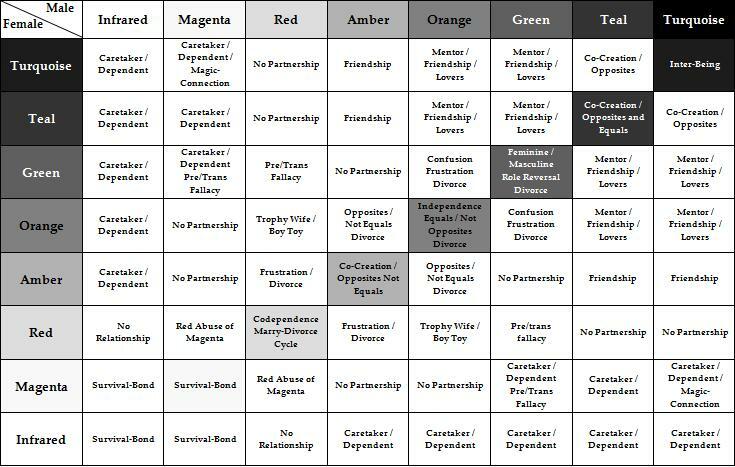 Using this matrix allows us to identify compatibilities and differences between us and our partner, and provides directions towards future growth potentials. You may, for example, be a pluralistic (green), feminine, kinesthetic, Enneagram type seven man at stage three of your spiritual, stage two of your sexual, and stage four of your anima complex development, who is in a partnership with a rational (orange), masculine, visual, Enneagram type three woman at stage four of her sexual, stage one of her spiritual, and stage five of her animus complex development. In the future, you may both remain at your vertical level of consciousness or grow further, become more masculine or feminine, or evolve along some or all of the three horizontal lines (or not). Couples with similar lifestyle choices, interests, intelligences, and passions, who are at the same level of their consciousness, spiritual, sexual, and anima/animus complex development, with opposite feminine/masculine polarities and complementary personality types experience the most fulfilling long-term partnerships. These compatibilities allow them to enjoy their sexual attraction and synergy, and to resolve conflicts by the same means until they grow apart in their developmental lines or lose their opposite sexual polarities. Partners with minor differences in their horizontal stage development may be able to get along and support each other in their growth. The conflicts between partners who have grown apart or realize that they are at different stages of development once the “love-struck phase” is over can’t be simply solved through better communication or other means of reconciliation. Their relationships are basically doomed–sorry.